She served in the military between 15 Oct 1942 and 24 May 1945 in Camp Hood, TX, USA.116 Her military service began as a 2nd Lieutenant, Army Nurse Corps, at Tilton General Hospital, Fort Dix, NJ on 15 Oct 1942. Transferred to McCloskey General Hospital, Camp Hood, TX, on November 7, 1942. Put in charge of the mess (date unknown). On 8 Feb 1944 became Chief Nurse at McCloskey with rank of 1st Lieutenant. She met Lt. Raymond J. Goetz at Camp Hood in July 1944. On 26 Oct 1944 became member of the Morale Council at McCloskey General Hospital, Temple, TX. Became Captain in March 1945 and separated from the service 24 May 1945 with this rank. She died on 4 Jun 1996 in Paterson, Passaic, NJ, USA. Dolores BALL (Carr) in 1992, wrote about "Aunt Vickie, who had the strength to maintain her rigid standards in a world trying to eliminate them. [She] stayed overnight at my home during a snowstorm shortly after I was married. From the moment she arrived she was in charge. She cleaned, cooked dinner and then - honest - ironed. When she left, she thanked me!" 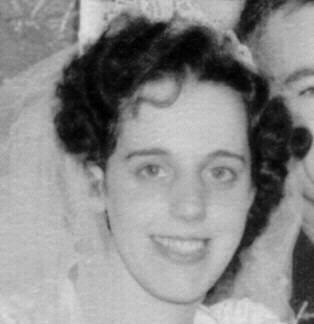 Victorina (Vicky) LAGOS BESTEIRO and Raymond J. GOETZ were married on 18 Nov 1944 in Paterson, Passaic, NJ, USA. i. Elizabeth Geraldine (Betty) GOETZ.